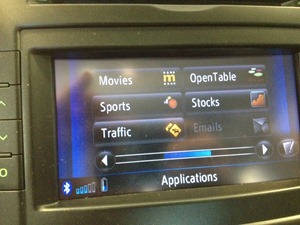 In April I blogged about my disappointment with the state of car dashboard technology in "My car ships with crapware." 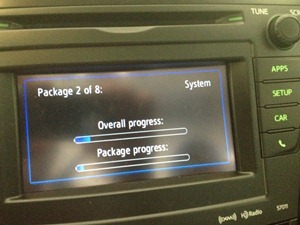 I recently bought a Toyota Prius with "Entune," an in-dash software system that includes things like Pandora and Bing. 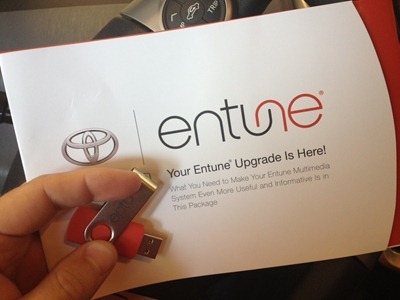 Imagine my surprise today when Toyota shipped all its Entune users an update on a USB Stick. This update promises new applications like IHeartRadio, OpenTable and MovieTickets.com. Updates can't be a bad thing, right? I put the USB key in while the car was parked and running. It prompts me to update and starts a straightforward process. You're told not to be driving around so I just waited a bit and it worked. When it was done, I ran the new MovieTickets.com app and was immediately given the warning: "Unable to connect to the Internet. Ensure the Entune Application is running." For the last few months I'm used to not having to connect my iPhone physically to my car with a USB Cable. 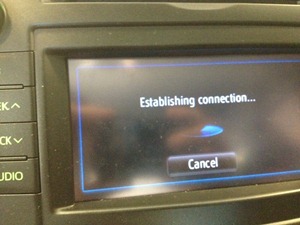 I don't have to run an application to "tether" and give the Toyota internet access. You CAN do this if you want. 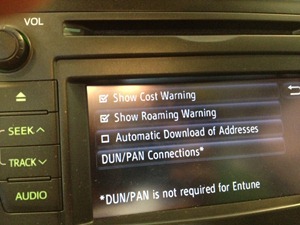 You plug the phone into the car and run the Entune application and you're all set with internet. However, in this case my first reaction was "CRAP. Toyota went and BROKE the thing with this new update and now they expect me to run the Entune iOS application when I want to tether. Oh, HELL no." This has been the response and belief of a bunch of folks in the Prius Chat and Toyota Forums as these updates are rolling out. I thought about this for a while and realize that what's actually happened is that the software has reset to defaults during the upgrade. You can still connect to a wireless hotspot like the Personal Hotspot that many of us have on our iPhones, Androids or Windows Phones. It's just that the language used by the Entune dashboard software isn't intuitive. From the Setup Menu, go to Bluetooth. You'll see that your phone is likely connected for Phone and Music but not Internet. Don't click Connect for Internet. That will get the error message and frustrate you. Instead, click the small Gear Icon to the far right of the same line. Here, under Provider Username, that's your Wireless Hotspot SSID. For iPhones it will be something like "Name's iPhone." Use a standard ' from the symbols menu on the on-screen keyboard. Spaces matter also. Enter your Personal Hotspot password in the password field. Confirm, then enter your Entune web account name and password if it's not there. After you're connected (and this should happen automatically from now on) you should have your new Movies, OpenTable and other applications on the other screens. 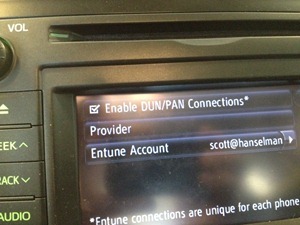 If you keep your Personal Hotspot running all the time then the Entune system should connect to your phone automatically for things like Pandora or iHeartRadio just because your phone is in the car. I hope this helps alleviate some potential frustration to Toyota Entune users. If you liked this post, read my screed essay on my the state of in-dash stock Car Software in 2012 and follow me on Twitter. Of course, even if Toyota didn't break the thing, an update that erases all your settings definitely has something wrong with it. Is there a workaround I don't have the teathering option on my iPhone? I have a 4s but I don't pay for the teathering option since I have unlimited data. I hate having to plug my phone each time to use the data through Entune. Do you really check stocks with your car?? I guess it's just Toyota being far behind the times. My BMW has a SIM build in (together with a 30gb harddrive and some, i'd say, rather good cpu). It goes so far that i can read emails, rss feeds and i can had through applications from iOS to the car (actually i could if i would have an iPhone). But in the end i guess we buy cars to get from a to b not to respond to our emails, search for movie tickets or watch youtube clips. Toyota Prius is the worsest car in the world. buy a BMW M3 and you will be happy. why people buy such bad cars? Haha, so we've found a way to bring back physical media for software update distributions. Oh, this should be fun. I'm sure grandma will have no problem figuring out why the headlights won't turn on via the touchscreen dashboard in her 2015 Zaibatsu. In good news, it means we have yet another industry to which we can bring software sanity...for a fee of course. bwahaha. I tried the fix in my 2012 Camry SE. Crossing my fingers...so far so good. I actually put the update in before I got my new Samsung Stratosphere phone so I've never had the Entune working smoothly. I just went out to my car and peformed the fix. I turned the car off and on at least a dozen times and every time Pandora, Weather and everythig else performed beautifully. Tomorrow will be the real test. Thanks in advance if it continues to perform. I bow down to Scott. My Entune is working beautifully now. I drove 100 miles today and not one single drop. Actually after I made a stop and turned the car off, I had to turn the bluetooth off and on again before it would connect. But after all the other stops, no problem. Scott should be reimbursed by Toyota for giving us information that the company should be giving us. Congrats and well done Scott. This fix didn't work with my 2012. I can't wait to get home to try this fix. Why don't the "experts" at the dealerships tell you this? I had to get a new Smartphone three days after we purchased our 2012 Camry SE and have had nothing with connection problems. Never had a connectivity Bluetooth problem with our 2009 Camry--I got in the car and Bluetooth connected automatically. That's not a guarantee with the 2012. I sure hope this fix works. I'll report back. How do you know what your personal hotspot password is? Joni - It's usually set on your phone directly. Marty - Glad it works. One interesting note to add, since I wrote this post my Entune system has in fact updated itself OVER THE AIR using my tethered phone. I cant seem to get this to work. Does my entune on my phone app need to be running? Do I have to enter the password on my phone somewhere? Do I have to have a HOTSPOT through AT&T? 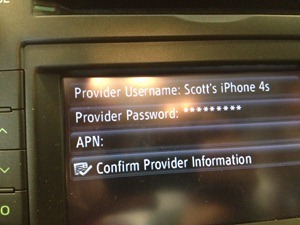 Where you find that password on the iphone for personal hotspot? This was the most helpful blog I have seen. I just purchased a 2013 Avalon Limited with the Tech package. I was going crazy to figure out why my internet radio would work sometimes and not others. Here is what I have found out. Details: Iphone5, Entune 2.1.0. 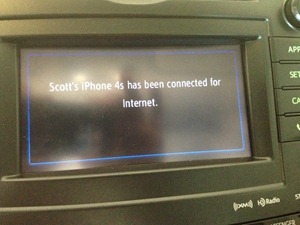 I read the owners manual on internet radio and it states that internet radio will not work when the Iphone is connected using the USB port. Yes bummer. I cant charge my phone and use Pandora or Iheart radio at the same time. 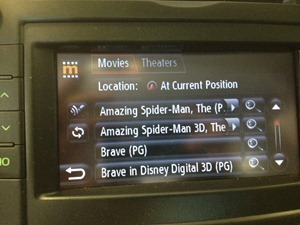 I tried to use this suggested Hot Spot but I could not find it in the Bluetooth setup that would let me get there. This is all for not. You do not need a hot spot for all of this to work. Here are you options. Make sure you are Bluetooth connected. 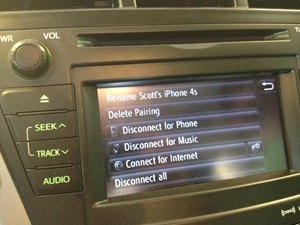 1)If you have an Iphone you can not use a USB connection in the car and get internet radio. 2) Make sure you have Entune and Iheart and Pandora apps running on your phone. 3) I have not tried this yet but I expect it would work to get internet radio and charging at the same time. Do not use the USB port. Get a 12V to USB cable for your Iphone. This will have no USB connection and still charge your phone. The other option is the QI magnetic charging system that I thought would come with my car but is not yet available. Well, I just spent 60 minutes on the phone with Toyota Entune as they told me that a personal wifi hotspot would not work with Entune - it had to be connected via the usb cable. So does this mean that I CAN use my Verizon Hot Spot for TCP/IP connection for Entune? 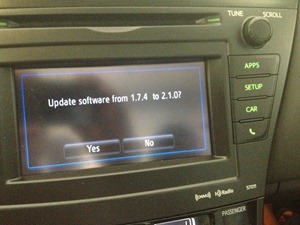 Toyota 2012 Camry with Lumia 920 via AT&T. Followed your instructions but no love. Sigh. I had this working with an older Windows phone before the update. Now nothing. Just keeps coming back that it can't connect to the internet. I got a 2013 Prius and had heard that Entune was bad. It is - voice recognition is awful. The added apps are a waste. For a navigation cost and these features, well makes one wonder if I should have bought a Ford. Hear there insync is far better. I've already made a decision from staying from Toyota. Entunes is the beginning, also built quality I'm not too impressed. In addition I found out that my 4 cylinder 95 camry gave me better gas mileage then the 2012 camry. I think Toyota is suffering from complacency that plagued American automakers before. Interesting how American automakers have improved to a point where I'm actually considering purchasing an American car. How do I know what my phone's hot spot is called, and what the password is? Where can I find that info? I have a Nexus 4 so I can create a WiFi hotspot, but I don't think that's what you are talking about. So where do I get the "Provider Username" and "Provider Password"? Scott, I am just curious if you have tried this or can confirm that it would work with a Windows 8 phone? I had it working with Windows 6.5 using tethering, until the update. Given that there is no Entune app for Windows Phone 8, I am not certain if that is a deal breaker or not? I have tried using the hotspot and the USB cable and neither works. I have my Entune system configured as you show above. I can connect my tablet and laptop to my phones wireless hotspot, so I know it is working. Given that Toyota just made this free, I would really like to take advantage of it. However, it is proving much more difficult than I had hoped. Where can I get the personal hotspot password ? This is an old thread, but it helped me with my situation, so hopefully my comment can help somebody else. I couldn't get the car to connect to my rooted Verizon Android phone via the regular Wi-Fi Hotspot, but once I enabled Bluetooth Tethering, the connection came right up. Perhaps it should have been more obvious to me that the Tacoma would connect using Bluetooth and not Wi-Fi, but I haven't seen anyone say that specifically, and thought it worth mentioning. Thank you for the help on this! Can you help me figure out why, with Mt iPhone 5 and my Galaxy NoteS3, the mail option doesn't open?